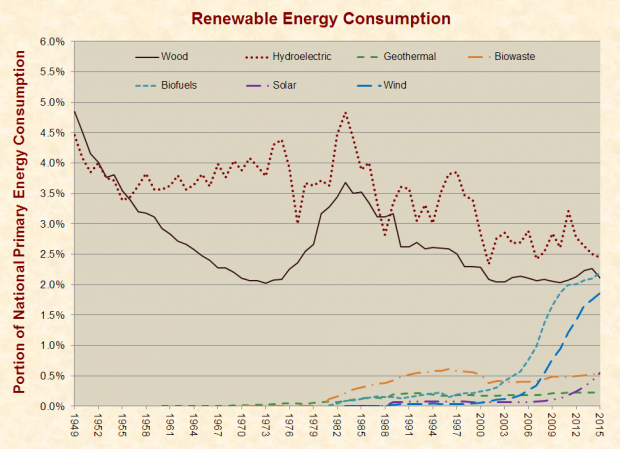 Burning wood still produces more energy than solar or wind power in America, according to a graph published by the research organization Just Facts. Burning wood provides 9 percent of the world’s energy, according to the United Nations’ Food And Agricultural Organization. Solar power provides less than 1 percent of the world’s energy, while wind power provides less than 2.6 percent, according to the International Energy Agency. Globally, wood still produces three times more electricity than solar panels and 11 times more than geothermal. More than 2 billion people depend on wood energy for cooking and heating, especially in developing countries. Wood energy could soon experience a renaissance in America, as the Senate passed a massive 800-page bipartisan energy bill in April, which defines wood harvested from forests as “renewable energy” and orders federal bureaucrats to promote it. U.S. foresters have been cutting down forests for years to supply fuel for Europe’s power plants, so using wood to generate electricity is nothing new. “In 2014, almost three-quarters of all U.S. wood pellet exports were delivered to the United Kingdom (UK), mainly for the purpose of generating electricity,” according to an Energy Information Administration (EIA) report published last April. Europe considers chopping down forests to burn wood to be “carbon-neutral,” and wood power has largely replaced coal power in Great Britain, Belgium and the Netherlands. In America, biomass provided more than twice as much electricity as solar power in 2015, according to the EIA.